As if the battery life on the first generation iPhone wasn’t bad enough, Apple has dropped the ball yet again on what otherwise would be the best phone on the market. With the release of the Juice Pack, Mophie came out swinging, refusing to let poor battery life get in the way of our iPhone addiction. Now available for the iPhone 3G, we had to test this model to make sure it is up to par with the rest of the Mophie line-up. The All-New mophie ‘Juice Pack 3G’ is now shipping and is designed to more than double the time you can Rock, Talk, Surf and Send with your iPhone 3G. This is the first Apple certified “Works With iPhone 3G” attached battery in the world! Juice Pack 3G is specially designed for iPhone 3G and has passed the strict over-the-air performance tests by an Apple designated test lab. 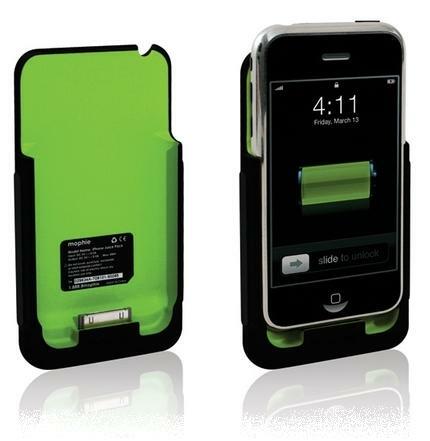 As a result, the Mophie Juice Pack 3G has been officially certified by Apple Inc. as a “Work with iPhone 3G” product! Mophie Juice Pack 3G also uses Apple designated connector, which can only be ordered through Apple’s certified vendors. This ensures its 100% compatibility with your iPhone 3G.